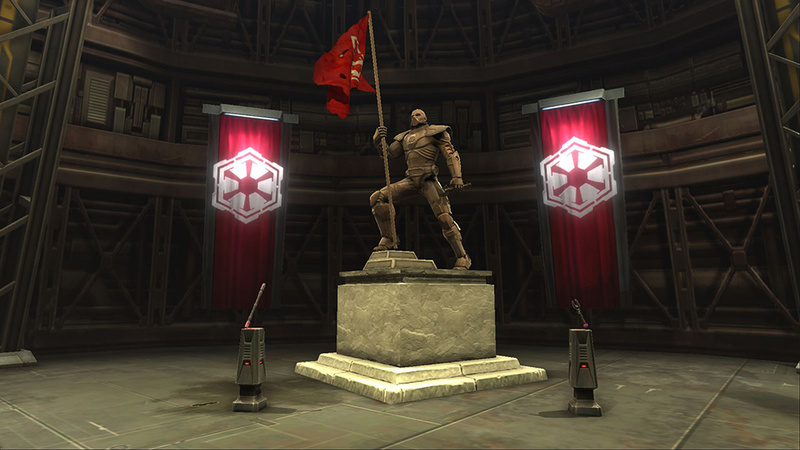 Help us celebrate seven years of Star Wars™: The Old Republic™! As a special thank you to our players, we’ve added some exciting new rewards that you can now claim in-game. Be sure to get your celebratory items by Tuesday, January 15th, 2018 to help make this a year to remember! Players level 10 and above can simply use the “Emergency Fleet Pass” ability located in your ability bar (type “P”) to get to either the Imperial or Republic Fleet. Then, head over to the “Strongholds and Crew Skills” area of the Fleet to get your rewards. Thank you for a great seven years and May the Force™ be with You! *THE 7-YEAR ANNIVERSARY PROMOTION FOR STAR WARS: THE OLD REPUBLIC (SWTOR) BEGINS TUESDAY, DECEMBER 11, 2018 AT 4:02AM PST AND ENDS TUESDAY, JANUARY 15, 2019 AT 4:00AM PST. PLAYERS MUST BE AT LEAST LEVEL 10 TO GET TO THE REPUBLIC OR IMPERIAL FLEET AND MAY UNLOCK UP TO 50 OF EACH DECORATION REWARD FOR THEIR LEGACY. THIS OFFER IS FOR PROMOTIONAL PURPOSES ONLY AND DOES NOT HAVE A CASH VALUE. REQUIRES AN ACTIVE ACCOUNT FOR SWTOR (AVAILABLE SEPARATELY). MAY NOT BE COMBINED WITH ANY OTHER PROMOTIONAL OR DISCOUNT OFFER, UNLESS EXPRESSLY AUTHORIZED BY EA; MAY NOT BE COMBINED WITH ANY PREPAID CARD REDEEMABLE FOR THE APPLICABLE CONTENT. OFFER MAY NOT BE SUBSTITUTED, EXCHANGED, SOLD OR REDEEMED FOR CASH OR OTHER GOODS OR SERVICES. ITEMS CANNOT BE SOLD OR TRADED IN-GAME. VOID WHERE PROHIBITED, TAXED OR RESTRICTED BY LAW. VISIT WWW.SWTOR.COM/FREE FOR ADDITIONAL DETAILS. ← Prev news: ‘Jedi Under Siege’ Update – Play Now!